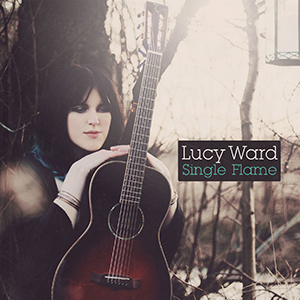 'Single flame' is the second album from 23 year old singer/guitarist Lucy Ward. With this album she has moved away from a straight folk sound and moved to a more modern sound that still shows it's folk roots. It's interesting listening to the album - with most singers you don't tend to notice an accent (The Proclaimers being a notable exception). On this album, Lucy's accent isnt noticeable most of the time, but every so often you get quite a strong accent showing through. 'Velvet sky' treads the line between folk and rock, and has quite a polished sound. It's a great song and has a much more commercial feel than most of the album that means while it will have a wide appeal, some folk fans may not be so keen on it. 'For the dead men' is a political song. Sung passionately with it's strong lyrics it's a great song and follows a long tradition of folk songs taking up political issues. 'Marching through the green grass' is a much faster, louder song. The fiddle gives it a folk feel, and it's a song that I can certainly imagine getting people dancing. This is a great album - some great music and beautiful vocals. Well worth a listen.